Christmas Ornaments Made in USA - 2004 U.S. Capitol Statue of Freedom Ornament - A Christmas Ornament Co. 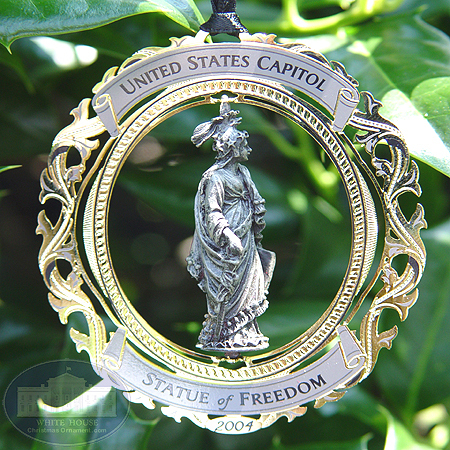 The A Christmas Ornament Collection presents The 2004 Statue of Freedom Ornament. The U. S. Capitol Historical Society's newest edition to it's annual metal series is this 2004 collector’s edition 3-D spinning ornament. Featured in the center is a replica of the magnificent bronze "Statue of Freedom" by Thomas Crawford that crowns the edifice of democracy, the United States Capitol. Beautifully gift boxed, this item contains a provenance gift enclosure.